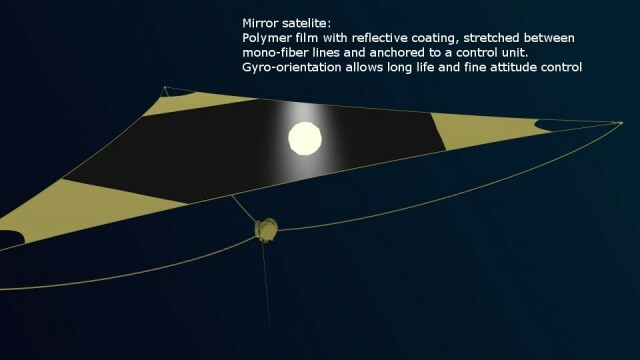 Designed to reflect light of all kinds, this mirrored film satellite is lightweight, cheap to build, and low maintenance. The three point tension film produces a flat surface. The control section sports three direct drive gyros for reactionless attitude control. This satellite can be used to reflect sunlight for power generation, illumination, or for shading other objects. Other applications include laser cornering, telescope clouds, and solar furnace arrays. The design is scalable, though larger units will be more difficult to steer, and will tend to warp under light pressure.